I'm happy to share another interview with Sabra Sasson on Coffee Break with Sabra! For this show, I provided five tips for homeowners preparing to sell! Take a peek at our conversation for tips on how to set your home apart from others on the market! Today, we are here with Anjie Cho, who is a holistic interior architect and has been creating beautiful and nourishing environments throughout New York City, San Francisco, Los Angeles and beyond for the last 15 years. Anjie is also the founder of Holistic Spaces, a blog integrating beauty, spirituality and green design. She creates and enhances balance and harmony by designing spaces with an understanding of sustainability and informed by the ancient practice of Feng Shui. Her focus is to create a nurturing and supportive environment for each of her clients at whatever level they feel comfortable. Anjie is a Feng Shui and green interior blog contributor to inhabitat.com and streeteasy.com’s blog, Own Your Home. 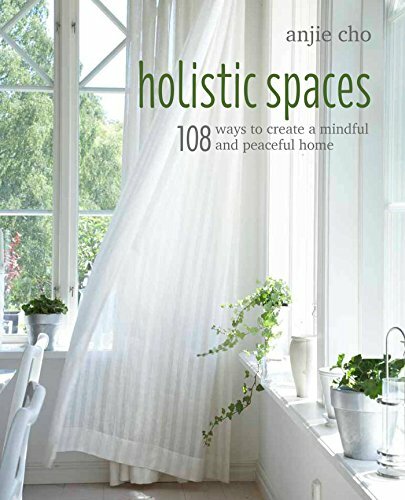 She’s a licensed architect, LEED accredited certified professional Feng Shui consultant and is currently working on her forth coming book: 108 Ways to Create Holistic Spaces, Feng Shui and Green Design for Healing and Organic Homes. I’m so happy to introduce Anjie Cho, and she’ll be speaking on the topic today of the top 5 dos and don’ts for sellers in a hot marketplace. Welcome to the program Anjie. AC: Hi Sabra. I’m so excited to be back on! Me too, very happy. Last program was amazing, and I’m sure this one you have some great tips for us. New York City is a happening place. Unfortunately, inventory is super low, so it’s a hot marketplace for sellers and they really have to do something to make their home stand out, out of the few that are out there and the buyers that are all out there competing for their homes. So today you’re speaking on this topic. Would you like to start? Yes, yes, of course. So when you ask me about the top 5 dos and don’ts for sellers in a hot marketplace, a lot of tips came to mind, but the most important one, the first one that came to mind, was to look at your front door. Your front door is so important, because that’s your face to the world, and the first impressions are really important, the first impression that a viable seller will have when they come to your home. So I recommend that you do look at your front door, the outside part, and look at do you need to repaint the door? Here in New York City, we have lot of apartments. You could ask your management company to repaint the door or maybe just need to scrub it down and clean it. But when someone, a seller, comes up to your door, when you have a dirty door, that already sets them in a kind of negative mindset, so it’s really important. Do look at your front door. Repaint it and clean the door. Make sure the door bell and the buzzer are working, because also if they come to your door and you can’t hear them when they’re at your door, when they can’t be let in to your home, that also creates a negative impact on their first impression. Look at all the parts of your door, like the hardware. When you open your door, does it squeak? When you open a door and there’s a squeak, it’s not very relaxing, and you want to have a door that opens smoothly. You want the door knob and the hinges and everything to be clean. The number on your door can also be cleaned and not crooked, because it gives an impression of thoughtfulness, of cleanliness, of relaxation when you have everything in the right place in the first impression. Wow! I love that first tip. It was totally took me off guard. I wasn’t expecting that answer. Here I’m thinking of seller’s tips for inside the home and, wow, the front door, first impressions, you hear that all the time, so fabulous. Fabulous tips! You have so much to touch upon just upon the entry way and the doorway. Yes. And absolutely the don’t would be: don’t overlook the front door. People often, like you said, only look inside. Don’t overlook the outside. Look at your hallway that people arrive in, if you’re in an apartment building, or if it’s a house, what’s the curb appeal? Are there old, dying bushes? You need to really look at what people see when they first arrive to your home. Make sure, this is one that I always point out, don’t have an old, dirty door mat. A lot of people have an old, dirty door mat. I would also say don’t have one that’s too personalized, like maybe with your name or frogs on it or something. Just have something that’s very basic, generic, but clean. I would even advise people to go out and buy a new door mat for this. Great point. So it’s the surroundings and the first impression of your front door and your entry way. Great. What’s your next tip? What else can you tell us? The next tip is actually when you walk in to the entry foyer, what do you see? So this is just past the front door. So again, buyers make their decisions on whether they like or don’t like a home within seconds of walking in. When my husband and I were looking for apartments, we would walk into a space and immediately we would say no, just no, no. I’ve talked to many real estate brokers, and it’s the same thing. People walk in and they just say, “Nope.” They’ve already created this no in their mind. You want people to walk in and feel like, “Oh, this is amazing!” You want to create a really good first impression. So it’s really important, in the first tip, to look at the front door. The second tip you should look at is, you should definitely brighten and lighten your entry and your foyer. That means, the views are, you should change your light bulbs. This is a really important one, because some people don’t have lights in their foyer, so get something up there. Maybe get a floor lamp or something, because it’s very important to have a light by your entry. When you walk in to a dark entry, you automatically feel negative and by adding a new light bulb, you’re kind of doing a little Feng Shui cure, where you’re adding new fire energy in to your entry, and fire energy is all about recognition and fame and being seen in the world. So if you’re adding this extra fire, new fire energy to your entry, you’re letting the universe know that “I am creating this big bright light that I want people to come to and be attracted to,” so you can attract the most viable buyers to your home. And the don’t would be: do not keep any personal items. Some people keep their shoes there. Don’t have any shoes out. A lot of people, especially when they’re moving, start to put their trash out in the entry. You start moving the things that you need to throw away or give away closer and closer to the door, and that’s not the best place to have the things that you want to give away and your trash and your waste. You should not be keeping those in the front door, even when you’re not showing, especially when you’re showing the space though. And storage and clutter, you need to really put those items away and keep a bright light entry foyer. Light, as in actual light, and then bright, as in bright and clear and not stuck with clutter. So it’s really about keeping it spacious and well lit to create a really strong first impression. Great. So I know you’ve talked a lot about light bulbs and lightening up the place. If the entry way happens to have windows, I would assume that that would be even better, to open up the shades and curtains to let in natural light in to the entry way if that’s possible. Absolutely, absolutely. That’s actually my fourth tip, it’s something about windows. Yeah, when we get in to that. But I was actually in an apartment with a broker, and the entry was, it did have a window in it, but it was in a light well, so it was still so dark, and it was a tiny entry and he had this big shelf that was right in front of you as you walked in. Then the radiator was to your left, and it was all dirty and the window was dingy. This is not the first impression you want to give to your possible buyers. Nice. So something very welcoming. You want people to walk in and kind of like feel they came home. They came in to a welcoming place that’s warm and comfortable and inviting and when the lights are on and it’s lit, you obviously feel like you’re supposed to be there as opposed to walking in to a dark room that doesn’t feel so inviting. I can feel that in the way that you talked about it. Absolutely, yeah, and these are really, really important things to make your home as attractive as possible to get you the best price when you sell your home. Fabulous. And also probably setting your home apart from the others that are out there, because you’re doing something with a purpose. So set it up, not to cover anything up, but just more to reveal and show your home in the best light, no pun intended. The best light possible so that, say, a buyer will find your place more appealing. Exactly. That’s exactly what I’m talking about. Great. So what’s your next tip? I want to hear more. Okay. The third tip is: do depersonalize. Now, we’re getting now into the inside of your home. Do make sure to depersonalize, and I think this is really important, because when you depersonalize your space, it allows possible future owners to really engage their personal energy in to the space and to visualize their home there. So don’t have a photo of you staring down at them when they walk in, and do start packing up those family photos. If you can, it would be even better to move them out of the house, because when people walk into a space, they don’t want to see your home. They want to see their home. They want to see them there. They want to be able to visualize their own family there, and that’s why a lot of stagers recommend you paint the walls white and not have anything that stands out too much, because it allows a blank canvass for people to begin to visualize themselves. It’s really important to, at the same time, when you start depersonalizing and taking down those family photos, you also as a home owner start to detach from the home and then you really have to step back and say, “This home served this purpose for me,” and really appreciate and thank the home for what place it served in your life, but now it’s time to close that door and to move forward on to your next place and the next part of your life. So many times, I see people that are trying to sell homes, and even businesses go through that too, where there’s someone in the family that’s not happy with leaving so they kind of dug their heels in and they want to stay, and that energy actually fills the space and keeps the space so other people can’t see themselves there. So even the process of taking down the photos, depersonalizing things, really is kind of a process and a little ritual that will help you start to disengage, and then in a real common sense way, allows people to then have a blank canvas to visualize their own life there. That makes perfect sense to me, because I know in the apartments that I lived in, when I went looking for apartments, there was something…I just knew I would know it when I walked in to the space. It’s just like you said, I could visualize myself there. I could visualize my furniture, my things in certain places around the place, and when I didn’t feel that there is space for me, that’s when I knew it wasn’t right for me. So that makes perfect sense what you’re saying, because you’re kind of being gracious. You’re taking down your personal things, making room for this new person, the new owner that’s going to come in and saying, “Hey, I’m now removing myself from here and stepping back so that you now can come in and fill the space.” It’s beautiful how you described it. Yeah. And everyone has their own vision of how things should look, and you’re making it, like you said, a blank slate like a white wall or neutral walls, so that they can visualize their own things on that wall filling up the space. Absolutely, being neutral. And there’s actually one more point, another do that goes along with depersonalizing. When you depersonalize something, people might think it looks too, empty and it is sometimes true that, when you have a completely empty apartment, some people have a hard time visualizing. So do keep your furniture, if you can, or get it staged, but if there are areas where you had a lot of personal stuff and you feel like it looks too empty, you can add very neutral items, like plants. Mirrors are great, because they expand the space and make the space look bigger, and lighting is actually really great too. So you can add plants, mirrors and lighting, and those will all enhance the space and fill the spots where you started to take away your own personal items. Great, wonderful. So that was just 3 things so far. We have to move on because we have a limited amount of time. What’s the fourth tip that you have for us? The fourth tip is do clean your windows. Your windows represent the eyes and the mouth of the inhabitants of the space, so when you have dirty windows, people will feel like they can’t see. They won’t be able to see your space clearly for what it is, and in a common sense way, it just brings in so much light, creates clarity. You can start to really see the beauty in the space when you have clean windows. It will make a huge difference. I recommend you get in there, or you hire someone, to just clean those windows really well and make sure that they’re spotless during all the showing. And then don’t block the view, or the light, with any furniture, with any objects. Even with drapes. People have drapes and mini blinds. If you can open them all up, if you can maximize the windows and the views because those are so important and people really need that connection to the outside. If you have a view of anything green, really emphasize it and enhance it. Simply cleaning the windows would be a huge thing. Nice, yeah, there’s nothing like natural light. I love opening up my curtains at home to bring in the lights. It makes a very big difference. That’s the fourth one, and the fifth tip is also very important. So you know how, Sabra, you were saying that when you were looking for an apartment you knew you would walk in and just kind of know? This is what clearing the energy is about. It’s really important that you clear the energy of your space. We kind of start doing that with the first 4 tips, but really formally clear the stagnant energy of the space. Have you ever been in to an apartment where maybe somebody passed away or even where someone’s lived there their whole life and it just has this kind of old, stagnant feeling? That’s really, really unattractive, right? People don’t like that, and people are repelled by that, because it’s very stagnant energy, and it’s uncomfortable. It’s really hard for people to get away from that. It’s hard for people to even consider that the situation could be different, so it’s really important to clear the energy of the space. How you do this, is you open all the windows for 9 minutes. Open all the windows, all the doors, everything that opens to outside, open it and air out the space for 9 minutes, and then you close everything. Then, they have these orange or citrus essential oil sprays. They have them at Whole Foods or health food stores. I would get a can of that, and walk around your space and spray this orange oil, because orange is very energetic and it has a lot of life to it and is very fresh. What it does is, that essential oil, that scent, really is able to clear and balance out any of that stagnant energy in the space. I always recommend that you also do this before every showing. Open up the windows for 9 minutes, close them and then spray the orange oil, and it will really create a fresher environment, and again, this leads to a good first impression. It’s really important to clear the energy of the space, because it gives a fresh, like depersonalizing, a fresh place to start with. Wow! That’s interesting. I have a question. Where’s the 9 minutes, why not 5 minutes or 10 minutes, a round number? Where is the source of 9 minutes? So you’re doing it for a purpose. It’s not something that you’re just casually doing. You’re opening the windows with purpose, you’re waiting the 9 minutes for a purpose, you’re spraying the orange. It’s not that it just so happens that this happens. You’re doing it with a meaning. Is that what’s it about? Yes, with the intention and a purpose is really important, because that is also part of the space clearing process. It’s not just about the orange spray, opening up the windows, that’s part of it. Your own energy, it sounds like. It’s something to create the momentum for clearing out the energy in the space. Yes, your participation is just as important. Very nice. That’s a really great tip. So I guess, is there something that you would say that people should absolutely not do? Would be terrible, if someone didn’t like orange, if they used lemon scent or some other scent like vanilla or whatnot? I know that you said that orange is very positive. It’s energetic. It has its own energy to it. I would stick to orange and not do any other scent, because they don’t have the same properties. But, my don’t for this tip would be: don’t overlook the fact that your energy that you left in this house is still going to be there, although maybe it’s positive energy. Say at an estate sale, people know when it’s an estate sale. They don’t have to be told, because they can feel the energy when they walk in. You can tell when someone passed away here or someone lived here for a long time. You can tell by the furniture, by the smells. Don’t overlook how much that impacts people’s impressions of the space. It will really bring your price down. It will really make people think twice about buying your space, so it’s really important to pay attention to it. Great. Oh wow, these are fabulous tips for sellers in this marketplace. Are there any final thoughts that you have or something you would like to emphasize for the listeners with regard to sellers who are selling their homes in this type of marketplace? I definitely want to emphasize again how much first impressions impact your ability to sell the space. It’s so important to realize that people make their decisions within the first few seconds of walking in, so really do look at front door and how things look on the outside and experience walking into a space, the first few moments of the space. It’s also really important to then highlight the best areas of your home. I didn’t talk about that, but if you have great views, find a visual way to lead people to the window. You can use a runner or something, people will just automatically find something to follow. Follow the runner and go over to the light, or maybe things like light fixtures in really amazing areas or up lighting and bringing up really high ceilings, things like that. Find out what the best qualities of your home are, whether it’s the view, whether it’s a great bedroom, and make sure you lead people to them. And again, do not forget about the entry door and the foyer, because that is where the first impressions happen. That’s great, really fabulous tip. It’s almost like you’re asking the seller to remind themselves of what it was that they loved about the space when they first moved in the space. Ah, yeah! Or what they didn’t like. Well, I don’t know if they would have moved in the first place if they didn’t like things. But certainly these are fabulous tips for sellers, if they follow each of these things, I’m sure, and it will help to set their homes apart from the others that are on the marketplace. Thank you Anjie! Thank you so much for being here. This was fantastic. Thank you so much. I can’t wait for the next one! Yes, well maybe next time you’ll talk about the dos and don’ts for buyers, things that they can look out for. That’s a great idea! Yes, that’s a great idea. Fantastic. So I want to thank you again Anjie for joining us and I want to thank our listeners for being there and join us again next week on Coffee Break with Sabra with our next guest.